Cats & Dogs - Friends? Spay or Neuter my Cat? 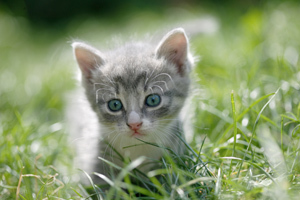 Whether you have a kitten or a cat that you're training to not be feral, litter box training can be a real chore. Kittens that are with a litter-trained mother will usually be trained by the mother cat, but once they're away from Mom, you get to take over. But you can't do what you do with children and use the litter box to show them! (You could, but that’s just not right!) Here are a few things you can do to encourage things along. Start young. The younger a cat learns to use the litter box, the more reliable they will be about it. Keep the kitten's bed near the litter box, or move the litter box closer to the cat's normal haunts. One very good place for the litter box during the training phase is your bathroom, if you can leave the door ajar when you go. The cat knows what you do in there, and if she sees you using the bathroom, she'll come in and try things out herself. Most bathrooms are tile, and cats don't like going on tile; they instinctively want to bury their waste, and the litter box is the only place to do that. You may find a problem with the cat going on the carpet or on clothes left on the floor; you'll have to remove these things until the cat starts using the litter box reliably. Be patient with accidents. Like small children, cats will have accidents, and they'll be a lot more arrogant about them. Don't rub a cat's nose in its waste but do show it the waste and scold it while you clean up the mess. The absolute critical thing you must do here is make the area smell different, unpleasant to the cat. I use a few different things: cut fresh lemon, mint teabags, Lysol, and – carefully and only as a last resort – bleach. Lemon and mint smell to a cat about the same way skunk smells to us, and they'll generally avoid it. Lysol is good for cleaning up, and if it's a citrus-based spray the cat won't like that any better than the lemons. Bleach will react with urine to produce highly toxic chlorine gas, which can make you very sick indeed; it was used in WWI gas warfare to kill people. If you can't keep the cat out of the corner any other way, put on rubber gloves, ventilate the area, keep pets and kids away, and spray or pour bleach in the corner after wiping up what you can. This can, of course, damage fabrics, so think ahead. If the fumes make you cough, get away from them! They'll dissipate shortly if you have things ventilated well. When you're finished bleaching, wipe up and rinse with clean water. I've also been told that putting aluminum foil down will keep the cat away, but I haven't tried that. And when you dispose of the waste, by the way, take it to the litter box and let the cat see you do so, so she knows where that's supposed to go. Consult the veterinarian. If your cat just can't seem to make it to the litter box, you should definitely take him to the vet. There may be an underlying medical issue causing your problem. Change the litter box often, but not so often to completely eliminate the odor. Cats are drawn to the odor of waste when they need to go to the bathroom; that's why you should clean up messes so thoroughly. But cats are fastidious and won't go to a litter box that is, in their estimation, too dirty. So don't change the litter box every day; instead, change it every other day -- and do not try to sanitize it. It won't work anyway, and it may trigger the cat to start going elsewhere. When Kitty starts using the corner or closet you can try these tricks to train your kitty. As noted above, lemon, mint, and cleaning solvents will chase the cat away. She may be drawn by the smell of your footwear, so try putting these up high where she can't get to them, and lay aluminum foil down on the floor as well. Block Kitty off from these places; if she's chosen your closet, close the closet door and evict her from your room; if she cries at the door, evict her to another part of the house, preferably close to the litter box. This article has been provided by Pug-Puppy.com and Alex Matthews - Pug Puppy / Dog for sale in Massachusetts. You have our permission to reprint or republish this article on your website or blog free of charge with the only conditions being that you publish the entire article exactly as it appears here, you notify us via email and publish it along with the active links http://www.pug-puppy.com and http://www.moredotcom.com pointing back to our sites, giving us proper credit for this article. You must also include this reprint permission paragraph with the article.